This week I promised myself that I would try and join in with as many linkeys as possible. Today I found The Gallery, a collection of posts and photos with a weekly theme. This week’s theme is “New” and it inspired me to write about a topic I have been wanting to share for a while. This is a very personal subject and something that has had a big effect on our lives over the last two years. My son was late to start talking and tended to rely on gestures and the word “no” to convey his meaning. He had always been very laid back and took his own time to do things so it didn’t overly worry me, he was obviously a happy little boy and his intelligence was clear even if he was quiet. Most of the children we knew started talking before him but I still wasn’t worried, I believed he would develop in his own time. My in-laws however didn’t agree, they were worried about our son’s development and became convinced that something was wrong. They became convinced that he was deaf and that he was trapped in his own world. It’s a long story of arguments (with them) and bad feeling but the end result is that I asked our doctor to refer our son to paediatric audiology at our local hospital in an attempt to settle things once and for all. Our GP mentioned when he referred us that it was possibly “a touch of glue ear” I didn’t believe my son’s hearing was affected but I did some research and found that glue ear is a common childhood condition where fluid builds up behind the ear drum. It can affect hearing and cause ear infections but in most cases will clear on its own over time. Now I have to hold my hands up here and admit I was wrong about his hearing. He had moderate to severe glue ear and his hearing was well below normal levels. I felt pretty bad that I hadn’t realised this, although as all the doctors and other people I spoke to said, it is a condition that is very often not picked up until school age. Admitting I had been wrong was hard, but even harder was that it didn’t really change my opinions on what we should do. All the literature and research we saw said that in the majority of cases of glue ear clears without intervention, although there are some cases like motherofmadcatsandbabies ‘s son where surgery is the right option and should be pursued. Because I had been wrong about the diagnosis I allowed myself to be swept along in the in-laws’ mission to solve the problem with surgery. My son was barely 2 at the time and even if his speech was delayed he wouldn’t go to school for another 3 years and I felt we had time to let things play out. Because of my guilt I didn’t speak up for a while, we saw an ENT consultant privately and we got to within a week of surgery (on the NHS for safety reasons) before I broke down in tears with my husband because I was so worried about our son having a general anaesthetic when I felt it was unnecessary at his age. My husband was lovely and hadn’t had any idea of how I felt. He supported me in the decision to cancel the surgery and pursue a “watch and wait” course of action. At his first follow up appointment with paediatric audiology our son’s hearing had improved significantly. It was summer so they asked to see him again in 6 months as glue ear can recur in the winter when infections are more common. In November when they saw him again our son’s hearing was pretty much perfect. He often complained of things being “too loud” and he was discharged from the audiology department with a clean bill of health. The “new” part of our lives which links to the gallery theme is that after a year of waiting lists and assessments we have now started speech therapy to help our son catch up with his speech. He tends to miss off the ends of words – something called “final consonant deletion”, which makes it hard for example to tell the difference between she and sheep or beep and beat. His frustration at trying to tell us what he has done at nursery or with his grandparents has been quite heart breaking, if we didn’t know the context of his sentences we often struggled to have conversations with him, meaning that he would sometimes struggle for weeks to explain something to us, as happened in the Windmill saga. 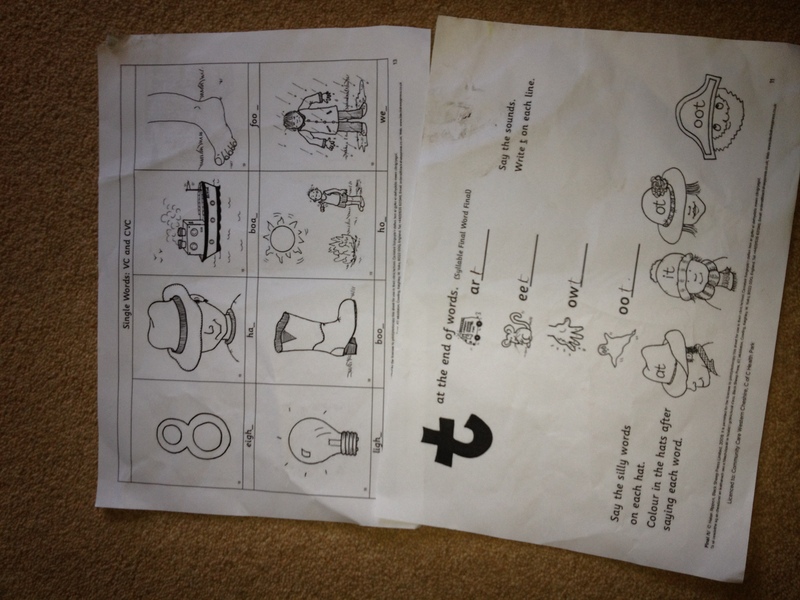 This entry was posted in Parenting and tagged ear infections, final consonant deletion, glue ear, grommets, guilt, paediatric audiology, speech therapy, surgery, watch and wait. Thank you for the mention. I am so pleased that surgery wasn’t needed for your son. I agree in most cases, that the watch and wait approach, is often the safest. I worked in ENT at Great Ormond Street, and we used to deal with the severe cases of glue ear, for surgical intervention and it is not a decision to be made lightly, to operate, by parents or the doctors, and the days of popping in grommets and whipping out tonsils and adenoids at the drop of a hat are long gone, because research shows that most children will recover with out surgery. Unfortunately, for M, we think he has some SPD from his ear issues, which are causing some problems, with his behaviour and we think he is in a fair amount of discomfort, and as he has had this on and off since he was 6 months old, and is now 3, we feel like we have no other option but to have his ears drained and grommets put in. It is hard when you are under pressure from family or friends to take an option that you don’t feel is quite right or the safest. My in-laws are horrified at the prospect of M having surgery, and really don’t want us to have it done, but we feel for M it is the best option. I actually know the surgeon we are seeing, and worked with him, so although the thought of him having a GA makes me feel a bit queasy, and I hate the idea of him being operated on, I know he is in very good hands, which is making it easier for me. It sounds like your little boy is making really good speech progress, and that his hearing has recovered. Glue ear, is such a simple thing, but can lead to so many issues and it sounds like that when he goes to school next year, he will be level with his peers and able to cope and communicate, which is excellent news. Thank you, we hope he will do well. We just need to get through the trauma of school place applications now!